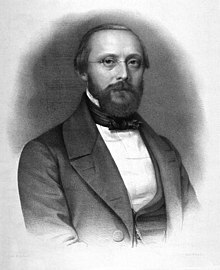 Rudolf Ludwig Karl Virchow (13 October 1821 – 5 September 1902) was a German doctor, anthropologist, pathologist, prehistorian, biologist and politician, known for his advancement of public health. Referred to as "the father of pathology," he is considered one of the founders of social medicine. He coined the catch-phrase omnis cellula e cellula, meaning, cells only derive from other cells. This page was last changed on 15 October 2018, at 17:38.